…yet it is something to consider well in advance, especially as you make the decision whether the moving company will be packing for you or not. If they are, you will still want to request that they send you packing materials prior to the actual moving date, as you’ll want to still pack certain things on your own—valuables, delicate items, sentimental items, what have you. This will also offer some peace of mind that everything will be packed in a timely manner. If you’re packing entirely on your own, as I did, quite simply make sure that you procure the materials yourself well in advance. Perhaps your moving company will allow you to purchase the goods entirely through them. Otherwise, you can find packing materials at stores like Mail Boxes Etc., UPS, or U-Haul. You may even be able to score cardboard boxes from friends and family who may save such things (if you know anyone moving domestically before you move internationally, ask them in advance if they’d consider saving their stuff! ), or outside stores where they dispose of their shipment boxes in/near their recycling bins. While reused boxes will obviously feature a little wear and tear, quality-enough ones can be resilient enough to trust. That being said, for an international relocation, your belongings will be traveling quite a ways by truck and boat, so you do want to be sure they’re secure. After three months separated from our own cargo, most of our boxes were a little worse for the wear. Conditions were evidently a little damp either in their holding container on the U.S. East Coast or the ship, so cardboard quality and corners were a bit dodgy on arrival. Wardrobe boxes are terribly handy—you can basically transfer everything on a hanger from the bar in your closet to the bar in the box, allowing your clothes to hang. Word to the wise, though: you’ll obviously want to cover your clothing in plastic first (garbage bags can suffice as garment bags just fine). Other supplies to consider: packing tape and padding—e.g., bubble wrap, packing paper, foam. 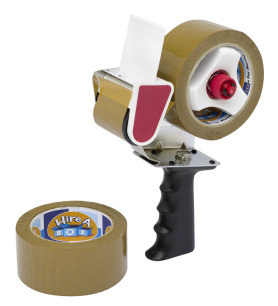 Ooh, and don’t forget those plastic tape dispensers that you can refill with additional rolls; they just make it all so much easier. London Relocation Ltd. wishes you a productive preparation for your London move—now get crackin’ on that packin’!